Hollowing tools come in a vast array of shapes and sizes: if you were to ask 10 turners for their favourite, you would probably receive 10 different answers! There are, however, a couple of issues on which many would agree, such as the difficulties encountered when trying to maintain an even wall thickness and the physical demands hollowing can inflict. The dangers of a catch are high. As the tip of a hollowing tool works its way down inside a piece, the effort needed to maintain control of the tool increases, the forces generated by having the cutting tip so far from the toolrest and, in some cases, hidden from view, may make hollow form work off-putting. To combat these issues Monster created the articulated arm hollowing system. Unlike captured systems, where the tool is held between two parallel bars, this rig uses a free-moving articulated arm, which, by the use of thrust bearings, gives the tool a smooth and varied range of movement while maintaining the cutting tip at the correct height and angle of approach. By locking the tip into the tool the risk of a serious catch is greatly reduced. Included is a laser guide, which projects a dot onto the outside of the piece. 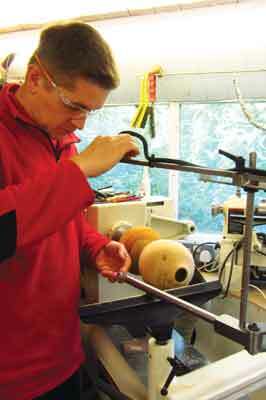 While hollowing, the dot from the laser mirrors the position of the tool inside the piece of work. These features combine to create a tool that not only absorbs the forces generated from a long tool overhang, but also constantly informs the user where the tip of the tool is during turning. The rig is supplied with a 270mm long, 20mm diameter boring bar, a 114mm extension bar and a range of hollowing tips, including a round carbide cutter, which allows hollowing on pieces up to about 280mm deep â€“ even further with the extension. A range of other tool shanks such as the swan-neck tool, and optional tips including a teardrop shear scraper, are also available. The final trick up the Monsterâ€™s sleeve is that, with the use of various adaptors, other brands of hollowing tools can be used in its arm. So, it incorporates their usefulness rather than replacing them! The Monster arrived in two packages. These were well packed with the contents in perfect condition. I had ordered the rig to be compatible with my Jet 3520B; however, Monster can cater for a wide range of different lathes. Included in my order were some optional extras to complement the basic package including a swan-neck tool, shear scraper and a small range of adaptors for mounting other hollowing tools. Build quality appeared to be very high, the articulated arm was nicely machined and the thrust bearings very smooth in movement; the locking handles on the various adjustment points all appeared to be positive. Setup was simple; I had received an email before the packages arrived containing instructions that were easy to follow. Everything fitted together well and in no time I had the rig clamped to the bed of my Jet 3520B in place of the tailstock. Setting the tip of the tool to centre height is critical but easily accomplished using the three locking nuts on the stem of the rig. Fine adjustment can be made by raising or lowering the toolrest, which is placed close to the work. The laser arm is set using the two locking arms on the top of the rig. The laser needs to be set at a distance from the tip of the tool that represents the required wall thickness. There are three cutting heads included, all very effective for removing wood. I found that the four HSS cutting tips needed to be cut in half so that the spare steel did not protrude from the back of the tool's tip. The carbide ring cutter worked well straight out of the box. Each tip is held in a holder that slots into the substantial 20mm boring bar. I was using cherry (Prunus spp.) and the smooth hiss of tool cutting wood was immensely satisfying. The ring cutter is supplied on a hexagonal shank; this locks into the rig by way of two locking nuts. Setting the tool's tip to the angle dictated by the shape of the shank set the tool at the optimum position for removing wood. The articulated arm is very smooth under load, and, while the downward forces generated are absorbed by the rig, the user still has to direct and control the tool. Hollowing still requires significant input from the user, but the possibility of a dangerous catch is minimised and, using the laser, there is no excuse for cutting through the side of a piece. 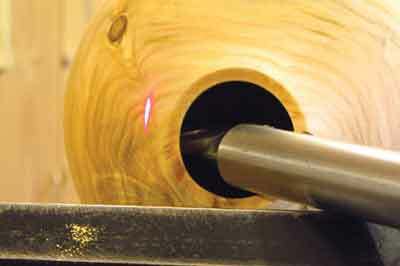 During hollowing, the laser dot edges closer to the outside profile of the piece being made. As soon as the laser dot disappears from the side of the piece, the required thickness has been achieved. Setting the laser correctly is vital, taking account of the position of the cutter, and where on the work you are cutting dictates the fine adjustment needed. I found myself taking a little time tweaking the laser's position as I worked down the piece, but this gets easier with experience. Having tried the cutters included, I then switched to the optional scraper tip and swan-neck shaft. These allowed improved access to the shoulder on the form I was making. The scraper is supplied on a similar hexagonal shaft to the ring cutter. Again, using the predetermined angle created ensured the tool worked well; however, I would have liked the flexibility to increase or reduce the angle. A round bar shank is available as an option and would provide the user with this level of control. The finish in the inside of the hollow form was superb. Finally, I wanted to try and attach some of my existing hollowing tools to the rig using the optional adjusters. 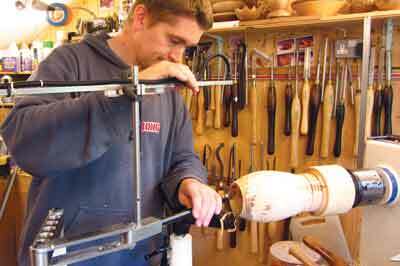 I started with my Woodcut hollowing tools, which fitted directly into the articulated arm. Once set up to cut on centre, these tools performed well. Indeed, all the other tools I had that fitted the various adaptors worked perfectly. This is a real advantage as the rig, rather than replacing older tools, gives them a new lease of life. I hollowed out a small hollow form using my mini Kelton hollowers and, while this is something that I could do quickly by hand, having the laser guide and the rig to take the strain meant that I was able to focus more on the piece. This is a fantastic piece of kit. 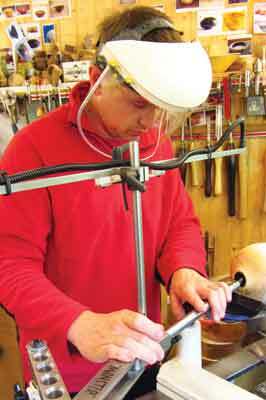 It does what it sets out to do, helping turners to hollow pieces. It takes the guesswork away, and it helps to take some of the strain. By way of the optional adaptors it offers an alternative way of using the variety of other hollowing tools we turners always seem to amass. This isn't just a stand-alone hollowing rig, although it could be used as such. If it were the only hollowing-type tool in your armoury, it would do the job well, but combined with the various accessories, it becomes even more useful. The 20mm boring bar may limit just how small you make the opening to your pieces; however, its mass makes for smooth chatter-free hollowing at large distances over the toolrest. For anyone who suffers with gripping issues, or who is finding the physical effort associated with hollow form turning too demanding, this excellent design would alleviate some of the issues and could enable you to continue making these challenging pieces. The laser is an effective way of controlling wall thickness; after only a short time using this system I can confidently reduce wall thickness down to 3-4mm through the entire piece. 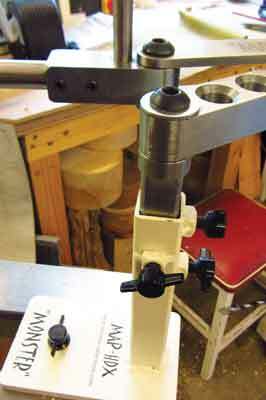 I would thoroughly recommend this hollowing rig to anyone wanting to make hollow forms, both open and closed.